Have your pearly whites lost their luster because of dingy gray or yellow stains? Stained teeth can occur as we age, but some common foods, drinks, and even mouthwashes can stain teeth. Do-it-yourself remedies can help whiten teeth, and avoiding substances that stain teeth can stop further discoloration. Use these secrets to whiter teeth to restore your bright smile. Tooth-whitening strips will help get rid of tooth stains. These strips are very thin, virtually invisible, and are coated with a peroxide-based whitening gel. You wear them a few minutes daily for a week or more. Results are visible in just a few days, and last at least a year. The results with strips are not as dramatic as with whitening kits, but the strips are easy to use and pretty much foolproof. You may be able to get rid of superficial stains by yourself. A number of at-home tooth-whitening products — kits, strips, toothpastes, and rinses– may lighten stains. There are even some old-fashioned remedies you can try. Tooth-whitening products available on drugstore shelves use mild bleach to brighten yellow teeth. Toothpastes use abrasives and chemicals to remove surface stains. For deep stains, you may need a dentist’s help. A home tooth-whitening kit contains carbamide peroxide, a bleach that can remove both deep and surface stains and actually changes your natural tooth color. If you have coffee-stained teeth, a tooth-bleaching kit can help. With some kits, you apply a peroxide-based gel (with a small brush) to the surface of your teeth. In other kits, the gel is in a tray that molds to the teeth. The tray must be worn daily (for 30 to 45 minutes) for a week or more. Some people still prefer the age-old home remedy of baking soda and a toothbrush to gently whiten teeth at home. Also, some foods such as celery, apples, pears, and carrots trigger lots of saliva, which helps wash away food debris on your teeth. Chewing sugarless gum is a tooth-cleansing action and also triggers saliva. 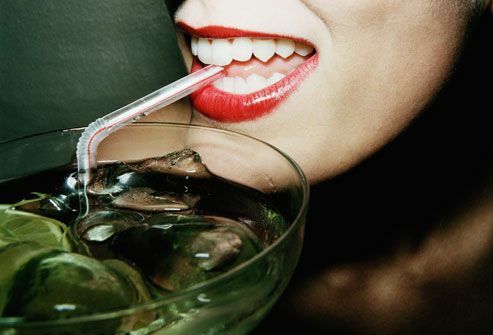 A bonus from all that saliva: It neutralizes the acid that causes tooth decay. With teeth, more saliva is better all around.